Windows 7, like its predecessors, Vista, and XP, allow users to quickly switch between user accounts while logged in. This is a fantastic feature because you can keep two different accounts logged in without losing any of the data you're using in one account while switching to the other. It's also a great time saver since you're not wasting time logging out and logging back in again. Here's how the feature works in Windows 7. If you share your computer with other members of the family you most likely employ user accounts for each member of the family. That way, system preferences, files, and other items are contained within separate accounts. If you only use one account on your PC, then this feature will not apply. If you are still uncertain about the advantages of user switching, let's illustrate a common scenario. You are working on a Word document using your account. Then your significant other walks up and says she needs to access files that are stored in her personal folders on her account. Rather than having to close the document you are working on, log out of your computer, and then let her log in you can just switch users and leave your work as is. No need to close all your applications or files, and no worries about data loss (that said you should still do a quick save of your work before switching accounts). The best part is this user switching happens in just three simple steps. To quickly switch between accounts, follow the instructions below. 1. While logged in to your account, click the Start button. 2. 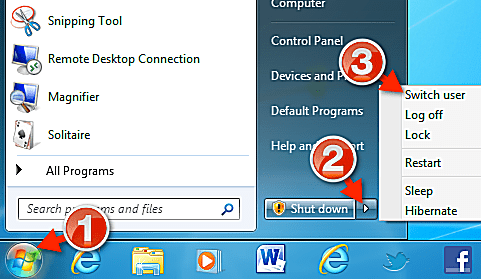 Then when the Start menu opens, click the small arrow next to the Shut down button to expand the menu. After you click Switch User, you will be taken to the Windows login screen where you will be able to select the second account you want to log in. The original account session will remain active, but it will be in the background while the other account is accessed. When you are done using the second account you have the option of switching back to the first account while keeping the second account in the background or logging out the second account altogether. Using the mouse to switch between accounts is great, but if you learn a few keyboard shortcuts you can actually accomplish this task much faster. One method is to hit the Windows logo key + L. This is technically the command for jumping to the lock screen, but it just so happens the lock screen is exactly where you need to be to switch users. A second option is to tap Ctrl + Alt + Delete. Most people use this shortcut to access the Task Manager, but you'll see there's also an option to switch users. Switch Again or Log Out From Account Number Two? Unless you'll need to access the second account several times, we recommend that you sign out from the second account before returning to the first. The reason for this is that keeping two active logins affects performance. Two accounts running at the same time means additional system resources are necessary to keep both accounts logged in. Most of the time it's just not worth it. Especially on a machine without a ton of RAM or disk space. Fast user switching is really the best way to access a second user account on your PC. So the next time someone bugs you to get off the computer for a few minutes, don't log out. Save time by following the instructions above and keeping your desktop's current state active — but don't forget to do a quick save before you switch, just in case.